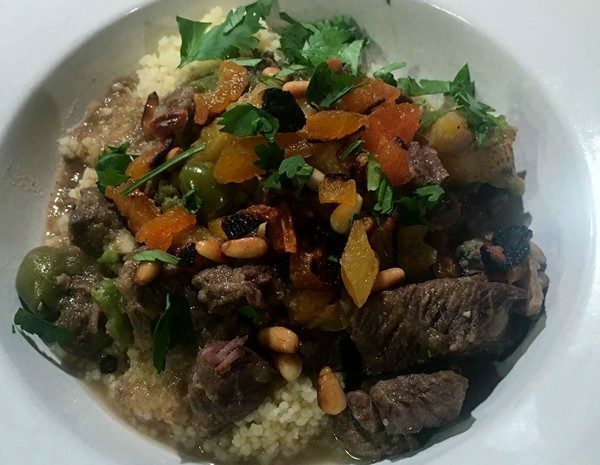 This lamb tagine came about because a recent special from Barb’s Butchery landed us with a nice package of lamb stew. 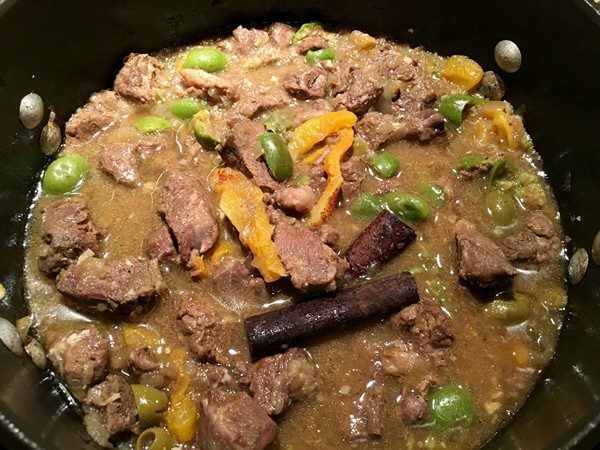 Turned out to be beautiful meat–tender and flavorful and made this a terrific dish. Trim excess fat from lamb. 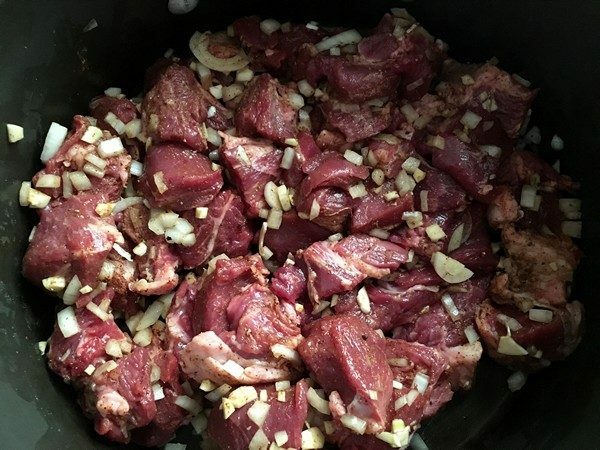 Put meat in a deep Dutch oven with the garlic, salt, black pepper, paprika, ginger and cumin. Rub spices and garlic evenly all over meat. Thinly slice onions, then mince enough of them to yield 1/2 cup. Add minced onion to pot with lamb; reserve onion slices. Place pot over high heat and let cook, turning meat on all sides, until spices release their scent, about 3 minutes. Meat does not need to be browned. Add 3 cups water to pot (it should come 3/4 of the way up lamb), along with cinnamon and saffron. Bring to a simmer, then cover pot and transfer to oven. Let braise for 45 minutes. Turn meat, then top with onion slices. Cover pot and braise for another 45 minutes to an hour, or until lamb is very tender. Use a slotted spoon to transfer meat to a bowl, leaving broth and onions in pot. Place pot on stove over high heat and add 3/4 cup apricots and the olives. Simmer broth until it reduces by a third and thickens slightly, about 10 minutes. Return lamb to pot and keep warm until serving. To serve, chop remaining 1/2 cup apricot slices. In a small skillet, melt butter. Add almonds and cook until well browned and toasted, about 2 minutes. Put couscous in a serving bowl and top with almonds and butter and chopped apricots. Pile tagine in center of couscous and garnish with herbs. Serve and enjoy! My verdict: Well Frank’s actually, “this is one of the best tagines you’ve ever made”. The lamb made this dish—tender and flavorful, it melted in your mouth. I swapped pine nuts for the almonds and that was fine. Next time, maybe fewer apricots and some preserved lemon, sliced into slivers. I used Castelvetrano olives and they might have been a little too subtle for the dish. The green olives looked good, but any combo of black and green would work fine. This is probably a way of saying that the dish needed salt, or in Frank’s case, harissa. You can make this ahead of time and just finish it while the couscous is cooking. There’s something everyone always searches out when they’re traveling. 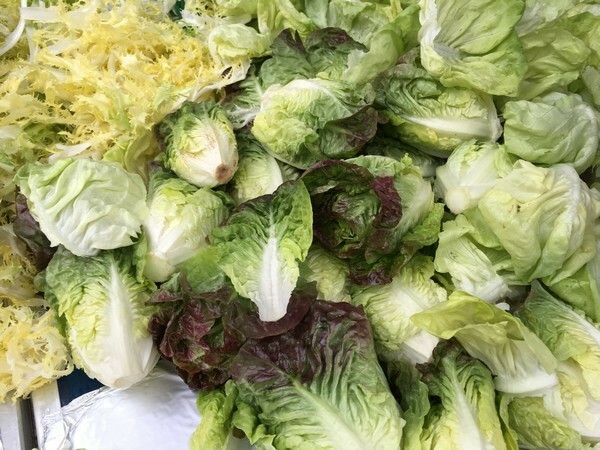 For my father, it’s hardware stores, for the Accidental Locavore, it’s markets. 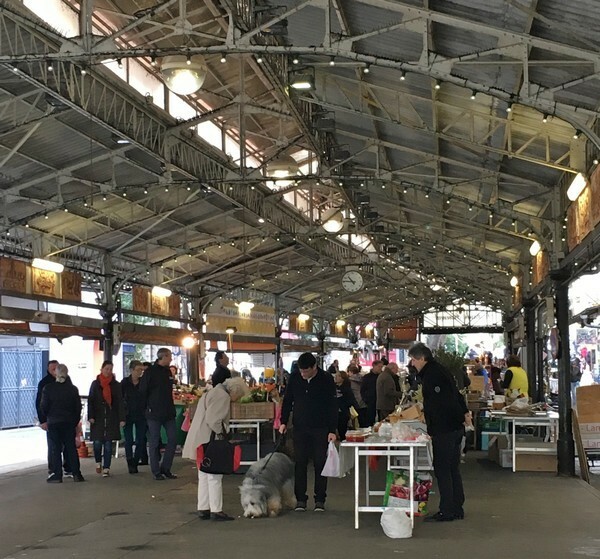 And when it comes to markets, the one in the old town of Nice is pretty much the standard. Beautiful flowers, perfect produce, it’s hard to find fault with it. 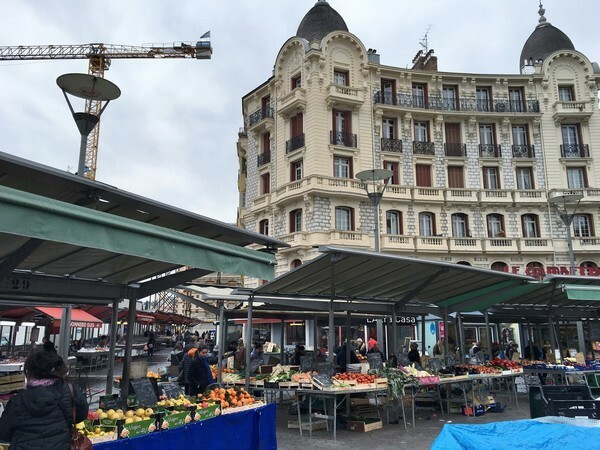 However, I’ve known for a while about the “real” market in Nice–where the folks who live there shop. It’s in Liberation, one stop north on the tram from the train station. I hopped on the tram the other day and went up to check it out. Where the Cours Salaya market is fairly compact, the one at Liberation ambles on for blocks. 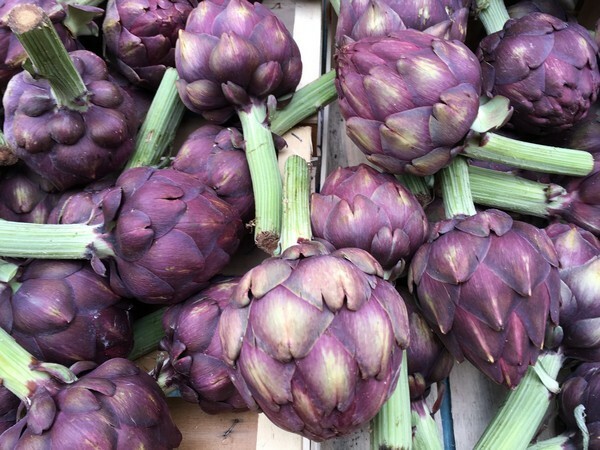 It’s almost exclusively produce and there’s a lot of repetition, but if you look carefully you’ll find treasures like these beautiful purple artichokes. Prices are lower too, but if you figure in the tram ride it’s probably a wash unless you’re stocking up (something that most French people never do). 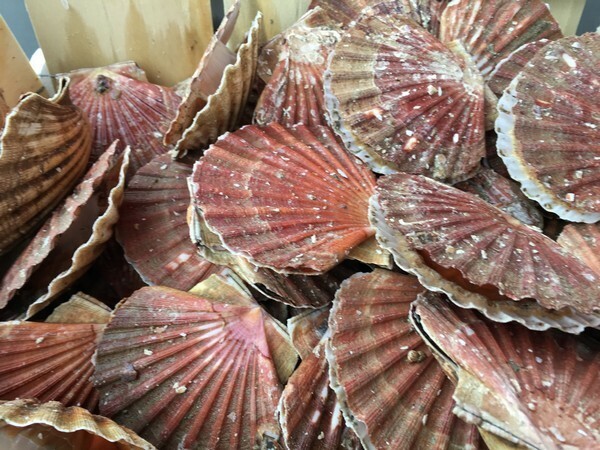 Down a side street, you’ll find fish mongers selling everything from the tiniest anchovies to whole fish to scallops still in the shell. 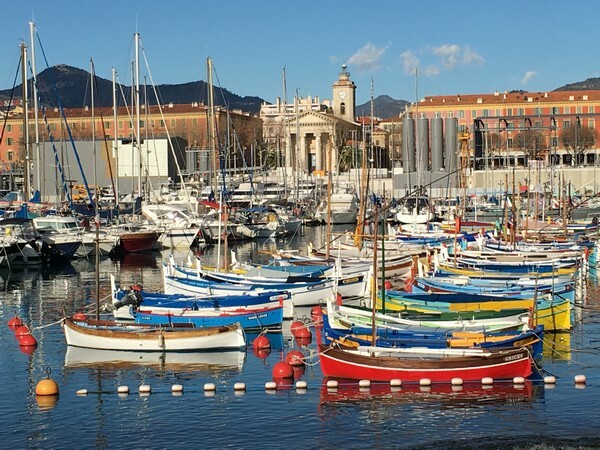 It’s supposed to be the best place in Nice to get seafood and you can easily see why. I took home a couple of the purple artichokes and some lettuce to go with a roast chicken from the local butcher. Like a lot of purple food, once cooked, the artichokes lost their color, but were still delicious, a little more citrus tasting than the ones we get at home. For sheer variety, there’s always the market in Antibes. Very dog-friendly, as you can see, there are a huge variety of goodies to choose from. 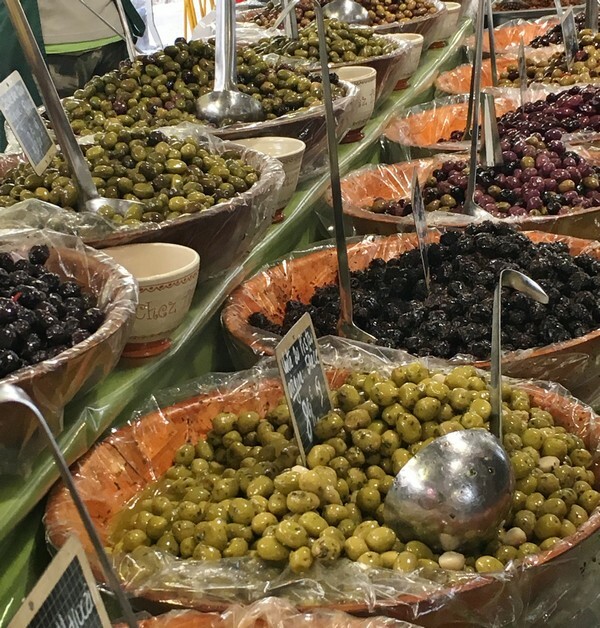 Along with produce, you’ll find some great charcuterie, local products like olive oils and tubs of tapenades. 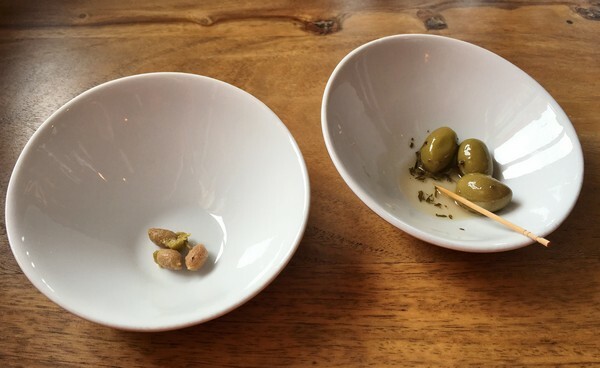 I’ve been on a mission to find green olives with garlic like they have at Le Passe-Plat. Although I still don’t think these were quite as good, I seem to have eaten half the container already (and am looking for an excuse to go back to Antibes for more). 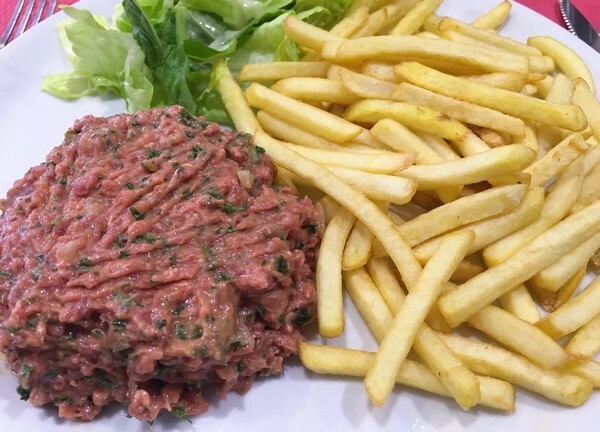 While the cheese guy was easy on the eyes and the cheese was good, I resisted and went on to find Frank a bottle of pastis from his favorite place and had a great lunch of steak tartare and frites. It started with the olives…small and green with garlic and herbs. Six, to be savored while sipping wine and waiting for the main course. Well worth searching out. To be truthful, it actually started out the other day when the Accidental Locavore was walking around the port. In another year or two it will once again be spectacular, but for now, it’s a glorified construction zone, awaiting the continuance of the tram. I saw a cute place on the corner and the menu looked interesting, so I filed it away for a future lunch. Le passe-plat is an open room, casual, with lamps perched on top of piles of wine boxes. There’s an open kitchen – rare for here, filled with copper pots, mason jars with spices and a handsome chef, Anthony Coppet, straight from central casting, dark hair, piercing blue eyes and two days’ stubble. I went in, curious about the pot au feu with Thai spices, but ended up with the plat du jour. 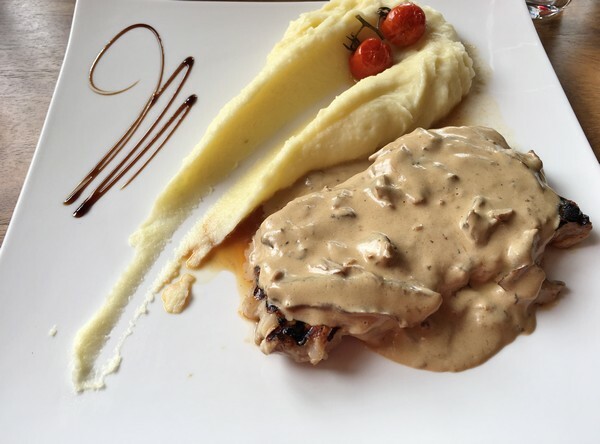 On this particular jour, it was a veal steak with a wild mushroom cream sauce and mashed potatoes. The veal turned out to be grilled and had that great grilled taste. The cream sauce was wonderful, with lots of mushrooms and possibly just a hint of Roquefort. There were a couple of cherry tomatoes as garnish, roasted into sweetness. And what can you say about mashed potatoes? It’s France and they were great! One of the things I always wonder about here is why most restaurant tables have four legs. It’s what French Morning NY would call a question bête, but here’s my answer – more room for dogs to stretch out. 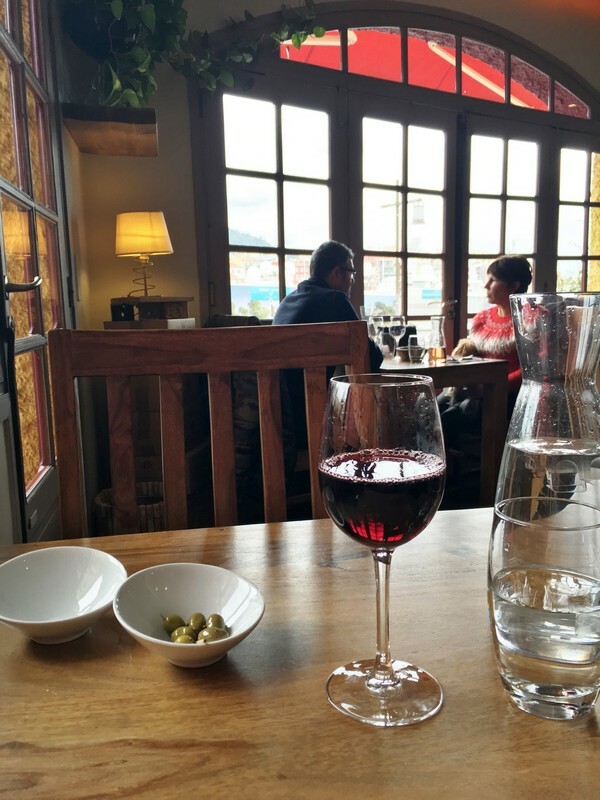 It struck me as amusing that the couple sitting by the window (with a dog) had risotto with scallops, which were served in a dish that had an uncanny resemblance to a dog’s bowl. Just saying. 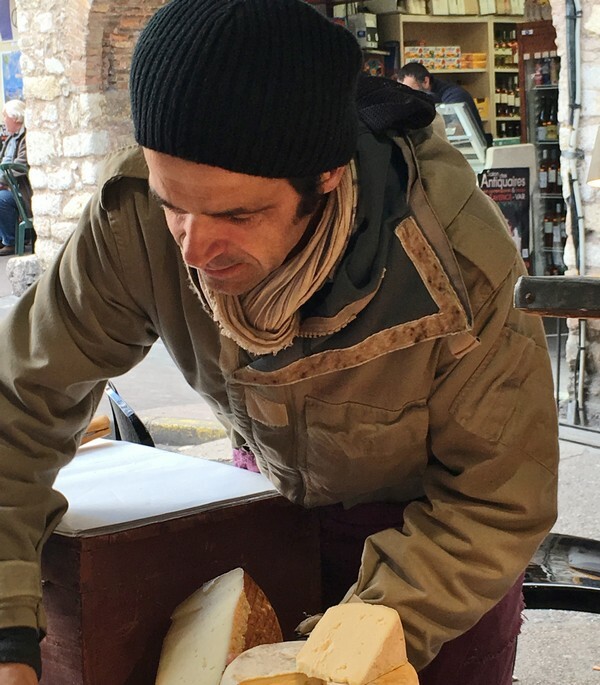 Expanding on my vocabulary, I learned that the ardoise de fromages was what I was hoping for – a cheese plate, and since ardoise means slate, it arrived on a handsome slab. 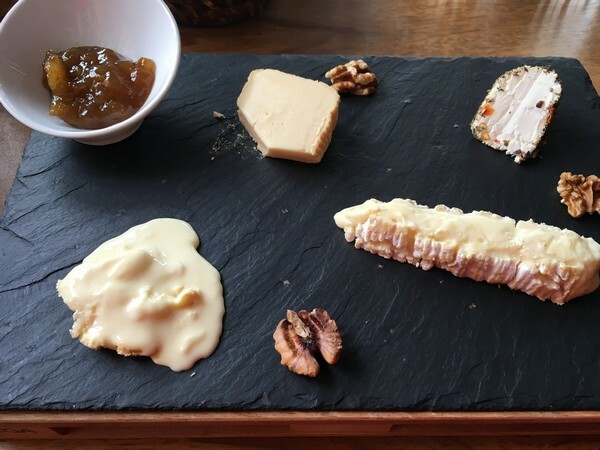 On the slate were a Brie, a chèvre rolled in herbs, a gooey vacherin and a semi-soft cheese like a mild Pont-l’Évêque. They were all good and worked well together and with the fig compote, but the chèvre was outstanding! Another thing to try to hunt down. I was happy and will be back to try the pot au feu soon. 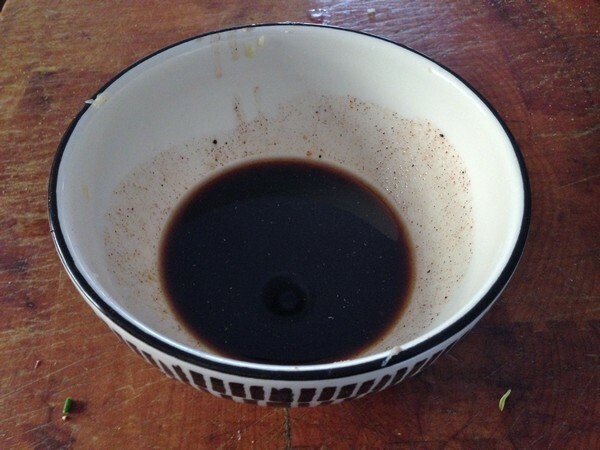 Mix the olive oil, cinnamon, cayenne, cumin, garlic and salt and pepper in a small bowl to make a marinade. 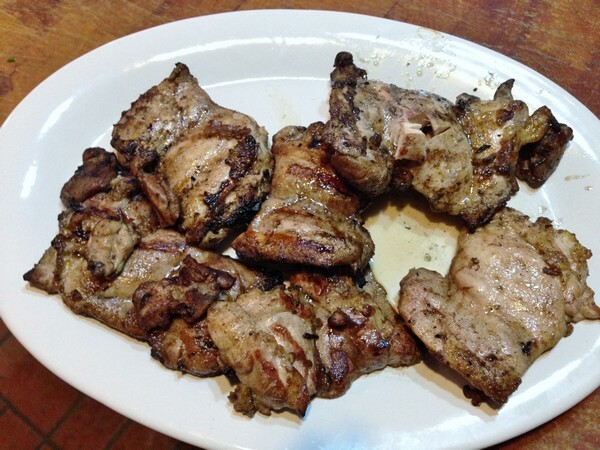 Make little slits all over the underside of the pieces of chicken with the point of a knife. Put the chicken in a Ziploc bag and pour the marinade over, turning to coat. Refrigerate for a few hours or overnight. Bring the chicken to room temperature before cooking. Make the sauce just before you cook the chicken. 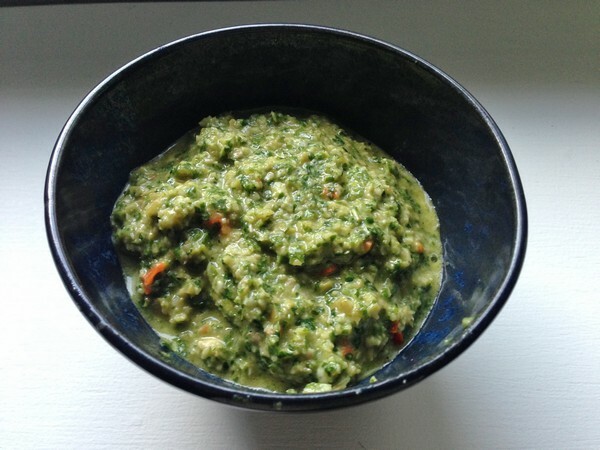 Put the garlic, chiles, cilantro, mint and olives and vinegar in the workbowl of a food processor and pulse until well combined. Gradually add the olive oil and process until you have a rough paste (it should be chunky). Add lemon juice and salt to taste and set aside in a small bowl. Heat a grill or grill pan on medium heat. Remove the chicken from the marinade, and shake off the excess. Cook the chicken for about two minutes on each side, then reduce the heat to low and cook for another four minutes per side. The chicken should be cooked through and singed, but not burnt. Serve the chicken with the sauce and lemon wedges and enjoy! My verdict: Great! I did the chicken thighs on the grill and they were delicious! If you can’t grill, a grill pan, or even a hot (400°) oven with a sheet pan would work fine. The sauce is really good with them and you can adjust the spice and salt to suit your personal taste (so mine was nice and spicy). The sauce would go well with a firm fish or even some lamb chops. 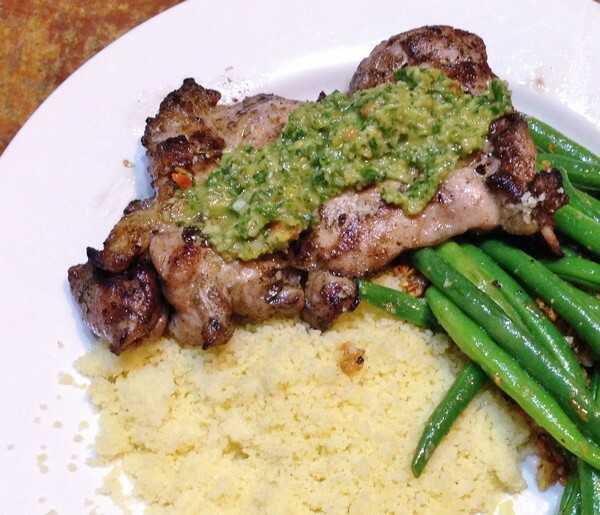 I served the chicken with couscous and some green beans, but eggplant would be a good side dish too. If you have any Greek yogurt or labneh, you could add that too.